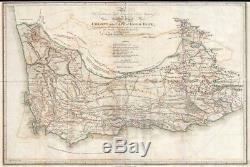 1805 Barrow Map of South Africa or the Cape Colony (1st Scientific map thereof). WE SELL ONLY ORIGINAL ANTIQUE MAPS - NOT REPRODUCTIONS JOIN OUR WEEKLY MAILING LIST FOR NEWEST STOCK. Title: To His Excellence the Right Honorable Earl of Macartney This General Chart of the Colony of the Cape of Good Hope, Constructed from bearing, estimation of distances and Frequent observations for Latitudes in Travelling throu' the Country in the Years 1797 & 1798 is Humbly Inscribe, by his Obedient and Faithful Servant, John Barrow. Description: Considered to be the first scientific mapping of South Africa, this is a fine example of John Barrow's scarce General Chart of the Colony of the Cape of Good Hope. The map covers the southern tip of Africa from the River Koussie to the Great Fish River and as far north as the Orange River sources in modern day Lesotho. Although not a trained cartographer, Barrow drew this map based upon his extensive travels between 1797 and 1798 wherein he was charged with surveying the area on wagon and by food as well as negotiating a reconciliation between Boers, Hottentots, and Kaffers, who were disputing territory. Barrow's routes are well defined throughout. The map presents a rich land, well-watered with great rivers, and teaming with animal life. Despite this, Barrows experience negotiating with the population led him to write, Having thus endeavoured to state the different points of view in which the Cape of Good Hope may be considered of importance to the British nation, from materials faithfully collected, and of unquestionable authority, the result of the whole will, I think, bear me out in this conclusion:âÃÃ®. That, as a mere territorial possession, it is not, in its present state, and probably never could become by any regulations, a colony worthy of the consideration of Great Britain or any other power. More than 10 years later William John Burchell (1782 âÃÃ¬ 1863) took Barrow's map with him on his own expedition into the South African interior. He had little good to say about Barrow's work, Its geographical deficiencies are so numerous, that in order to give it some appearance of a map the compiler of it has been reduced to the necessity of spreading it over with scraps of information taken from the text, and with lists of wild animals. Nonetheless, Burchell used Barrow's map as the base of his much improved map of the region. The map was engraved by Samuel Neele and published by Cadell and Davis to accompany Barrow's An Account of Travels into the Interior of Southern Africa, in the Years 1797 and 1798. Size: Printed area measures 18.5 inches high by 28 inches wide. Wear and light verso reinfordcement here and there on original fold lines. If your address is a P. DHL International EXPRESS (45 USD). We can use your Federal Express Account. Duty varies by country and we cannot predict the amount you will be charged. Some countries are duty free, others are not. Additional Services Conservation Framing Services: Geographicus recommends basic conservation framing services for any antique paper. We do not offer this service. Antique Map Restoration Services: Geographicus can repair and restore your antique map. Services include deacidification cleaning flattening and backing. The item "1805 Barrow Map of South Africa or the Cape Colony (1st Scientific map thereof)" is in sale since Monday, June 18, 2018. This item is in the category "Antiques\Maps, Atlases & Globes\Africa Maps".